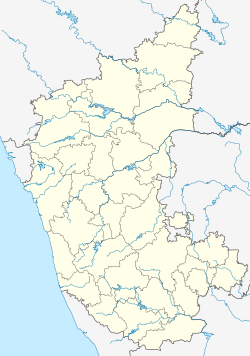 Kumta is a town and a taluk in the Uttara Kannada district of Karnataka, India. Kumta is about 142 km south of Margao and 58 km north of Bhatkal. It is situated 72.7 km from Karwar, the district headquarters. It is one of the important stations along the Konkan Railway line running between Mumbai and Mangalore. The city of Kumta is located on the Arabian sea coast in the district of North Kanara in the state of Karnataka. Kumta is adjacent to the vast western ghats 14°25′N 74°24′E﻿ / ﻿14.42°N 74.4°E﻿ / 14.42; 74.4. It has an average elevation of 3 metres (9 feet). To the north of city, the major Aghanashini river joins the Arabian Sea on her way rendering stunning scenery. The town of Gokarna near Kumta is famous for beaches. A nearby Rock Climbing spot called Yana is also beautiful with its massive black rock formations and nature trails. Kumta is very well connected by road. One of the busiest highway National Highway 66 (NH 66-Panvel-Kochi-Kanyakumari) passes through Kumta. Kumta is also connected to State Highway-142 (SH 142 - Kumta-Sirsi) and also to Kumta-Siddapura Road. The North Western Karnataka Road Transport Corporation (NWKRTC) is the state run bus service in Kumta. Kumta station is served by the Netravati Express train run by Konkan Railways. ^ "(Train Schedule / 16345 Netravati Express)". Passenger Info. Konkan Railways. Retrieved 28 October 2018. Wikimedia Commons has media related to Kumta.